The love for the pets is quite natural to humans. People throughout the world love to keep pets having marvelous and unique characteristics. When it comes to the pets, then the dog is considered to be the most loveable and likable pet ever. Even, the children feel pleasure while playing with them and enjoy their company. It is necessary to make a research about the dogs in order to comprehend the natures and characteristics of the dog. 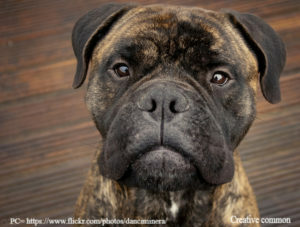 If you are planning to purchase the Bullmastiff, guard dog, then the Bullmastiff-info.com would be beneficial for you. It helps you out in making a right decision. The history of Bullmastiff dog reveals that this brave dog breed was originated in the mid-1800s in Britain. The gamekeepers loved to have this breed with them because of its qualities such as speed, size, strength and fearless nature. Bullmastiff is an outcome of the crossbreed of Bulldog and Mastiff dog. Bullmastiff is quite daring and strong dog. People of that era feel safe while moving it with this dog. Another name given to it was “Gamekeeper’s Night Dog”. One of the most eminent characteristics of Bullmastiff dog is their attacking nature. These are quite confident and fearless. Their quality of being fearless made them the most likable choice for the warfare. The ancestors of Bullmastiff dog, Bulldog and Mastiff, were not large and swift. With the evolution of the Bullmastiff dog, the desire of the gamekeepers to have a strong and powerful dog was quenched. People found that this crossbreed was able enough to easily fight with other animals when commanded. The feeling of protection and security got a boost. The modern Bullmastiff is aimed to contain 40 percent and 60 percent traits of Bulldog and Mastiff, respectively. Until 1924, it was considered to be a pure breed. Later on, its enormous varieties were produced. The lifespan of the dogs varies from breed to breed. The average lifespan of Bullmastiff dog is of 8-10 years. The most purebred dogs depict a bit more lifespan as compared to the Bullmastiff dog. Purebred usually have 10-13 years lifespan. It is mainly because the Bullmastiff has some potential hereditary defects. Such disorders and defects are not present in all dogs but many of them exhibit such health issues. These include lymphoma, mast cell tumor, allergies, hypothyroidism, elbow dysplasia, bloat, entropion, progressive retinal atrophy, osteosarcoma and subaortic stenosis. The range of Bullmastiff dog’s weight ranges from 100-130 pounds. Female Bullmastiff weighs 100 pounds to 120 pounds while the male Bullmastiff weighs from 110 pounds to 130 pounds. There exists plenty of wrinkles on Bullmastiff’s forehead. The dark colored ears, black face mask, and big blocky head add elegance to its appearance. Sometimes, they show aggressive behavior towards the strangers. These are highly loyal, affectionate, and intelligent dog. People looking for the loyal dogs would surely enjoy having a Bullmastiff dog. Having a look at the Bluffmastiff dog breed all information, the most interesting facts come to light.They require consistency in order to behave like a perfect family member. Consider to socialize and train them in order to get the best out of them. These breed dogs are natural guardians and independent. They protect their owners and home. An amazing fact to know about this breed is that it does not require any sort of guard training when his master is in danger. Obedience, tracking, carting, and agility are some of its prominent characteristics. Let us have a look at some popular breed types of Bullmastiff. These include Tibetan Mastiffs, Neapolitan Mastiffs, and English Mastiff. Each breed has its own peculiar characteristics by which they win the heart of people. The common traits and characteristics which this breed share are their active minds, loyalty and protective nature. They can develop joint problems by the excessive exercise. People having an interest in the Bullmastiff dog breed would feel pleased to know that this dog has beautifully dense and short coat. Its purpose is to provide fabulous protection in the bad weather like cold, rain and snow. BullMastiff dog colors are important to know. This breed comes in three adorable colors that include brindle, fawn, and red. Brindle colored dog has streaks and specks of enormous dark and light markings. These can be cleaned easily with the brushing. Use a brush having rubber curry to clean the coats of your Bullmastiff. Maintaining their hygiene is fabulously easy. Among all the colors of Bullmastiff dog, the brindle one is the most desirable one. People, especially children love to buy a brindle Bullmastiff dog. The brindle colored dog contains the adorable strips of red or fawn color. Its appeal is one of the most dominating factors for its popularity. This breed does not contain any white-colored marking on its body with an exception of a little white color on the chest. Fawn Bull Mastiff dog ranges in color from very dull brown color to the brighter shades such as reddish brown. Bullmastiff is an ideal dog as it required low maintenance, exhibits moderate shedding and are good with kids. They are the favorite pet of majority of the kids. Their suitability for kids is mainly because of their energetic, affectionate and playful nature. It’s fun to play with them. When it comes to the red Bull Mastiff dog then it also depicts a range of color. This range of color begins from the adorable light red fawn to the most prominent and bright rich red. Bullmastiff dog represents powerful athletic bodies and is relatively quiet as compared to other dogs. Bullmastiff-info.com is for all the dog lovers who are looking for a breed that is friendly to their kids and fight for them at the time of danger. Get the guideline which you are looking for and bring the best in your home. Bullmastiff dog is the massive and powerful dog. These are easy to care and fun to be around. 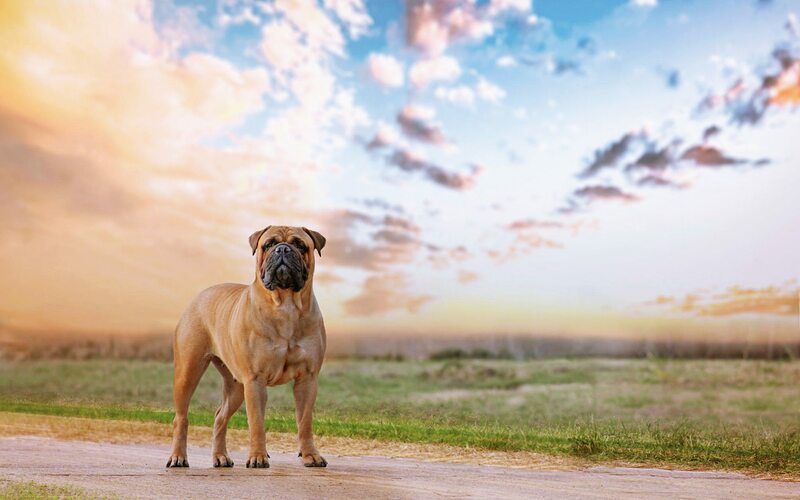 The feeling of security and protection gets a boost when you have a loyal and honest Bullmastiff dog around you. A moderate exercise is enough for them. By knowing all the characteristics, features, behavior and nature of Bullmastiff dog, you will be able to make a decision that is not merely right for you but for your family as well. Appearance is one of the most important elements that is considered by the people while selecting their pet. Appearance varies from breed to breed. Bullmastiff appearance depicts the wrinkled heads, dark muzzle, and ears. Ears are powerful, strong and large dogs which have pendant shaped dark ears. Having the handsome black mask is one of the most prominent features of Bullmastiff. It distinguishes them from the dogs of other breeds. This peculiar quality adds elegance to their beauty. The tale of this breed is slightly tapered and set high on its body. Bullmastiff dog has a short but dense coat that is protective in function. These are relatively active. Hence, they prove themselves to be a great a source of pleasure for the kids and plays with them actively. They are well known for their endurance, strength, and alertness. Some people love to have a pet of large size while some find charm in having cute little pets. It is entirely dependent on the people’s personal choice. 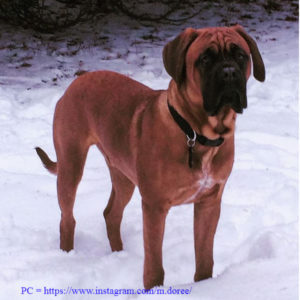 If you have seen a beautiful and brave Bullmastiff dog in your neighbor and wishes to purchase one for yourself too then this guide would let you know all the facts about your favorite pet. The adorable appearance of Bullmastiff dog surely won million of hearts and people throughout the globe feel secure and satisfied to have this dog as a pet. The Bullmastiff dog size of a male ranges from 25 inches to 27 inches while female Bullmastiff dog depicts a size of 24 inches to 26 inches. Their muscular body is enough to frighten the enemies. The training and socialization of a Bullmastiff dog are easy. The muscular and large boned dog, the Bullmastiff, is a smart breed. His alertness is commendable. It plays a marvelous role in figuring out the danger. When it comes to the physical appeal of the Bullmastiff dog, it shows a tall body frame with spectacular features. One of such features is the Bullmastiff dog ears. This adorable breed attracts other due to its fabulously distinct V-shaped ears. These are not merely of V-shaped but are darker in color. Such trait provides it a powerful and strong appeal. At the time of teething, Bullmastiff folds its ear in the backward direction. This pet exhibits the same pattern of growing the ear backward in the similar way the English bulldog does. If you are an owner of the Bullmastiff dog and you observe the folding of your pet’s ear then it is the right time to tape its ears. In this way, the fabulous V-shape of its ear would be maintained. Most probably, the folding of the ear occurs at the age of 3-4 months. The purpose of Bullmastiff dog’s ear tapping is to ensure the natural look of the ear. Hence, the right position is maintained. Taping of the dog’s ear for a few weeks is enough for the proper growth of the ear. However, there are a few dogs which require constant taping for almost a whole year of their life for the correction of their ear’s growth pattern. It is important to mention that not all the dogs require the taping of their ears. Its head contains typical black marking. One can easily observe the beautifully level back and slightly arched neck of Bullmastiff dog. This vigorously built dog contain tapered tails and well-developed legs. Bullmastiff dog tail is strong and powerful. The tail is tapered at a point and is set high. It contains medium sized feet with thick pads, arched and round toes. They have black nails on their feet. The level of their back is maintained during their gait. This leveled back is responsible for making their gait charming, powerful and smooth. It is necessary that the weight of the dog should be in accordance or proportion to their height. Hence, height is the element which should be considered while determining the weight of the Bullmastiff dog. Bullmastiff dog weight imbalance is either due to a disease or improper nutrition/diet. Owners should focus on the balanced diet of their pet in order to ensure their good health. No one like to have an underweight or over-weight pet. An ideal pet is the one who is being fed with the balanced diet having great nutritious value. Sometimes, it may happen that the most active and healthy Bullmastiff dog suddenly losses the weight and its appetite is reduced as well. The owners of the pet should consider it as a tragic situation and take their Bullmastiff to the vet for the medical examination. In this way, the disease could be diagnosed at the earlier stage and could be treated accordingly. It is seen that in many types of cancer and medical diseases, the appetite of the pet decrease and they experience weight loss. Hence, it is necessary to be aware of the normal weight range of the Bullmastiff. The normal range of weight for a Bullmastiff is from 110 to 130 pounds. The weight range for a male Bullmastiff is 110-130 pounds and for the female Bullmastiff, it ranges from 100-120 pounds. However, the height of 24 inches to 27 inches is considered to be an ideal one for the Bullmastiff. Bullmastiff is one of the most brilliant and loyal dogs which exhibits a great impression on the people at the first glance. What a beautiful stance and wonderful strong body it has! Bullmastiff dog paws and size shape are impressive as well. The paw is firm and strong having the black nail on them. It is the outstanding body shape and alertness of the Bullmastiff that makes it be a part of several movies of TV shows. The ideal appearance of Bullmastiff is responsible for its consideration in movies. These great dogs are seen in TV shows such as American Chopper and movies such as Rocky II. They know how to socialize in the most effective way. Train and socialize them properly and avoid being harsh on them. They comprehend well whatever is taught to them. The most suitable time for training and socializing is their easy childhood. Its powerful paws and strong legs are ideal for performing the jumping and walking activities. Their matchless and desirable speed is because of their powerful feet and paws. One can easily observe the gorgeous gait of a Bullmastiff having the perfect body shape. Take your pet to walking on a routine basis. In addition, this, let them exercise too in order to maintain their perfect body shape. Bullmastiff dog’s behavior with the children is brilliant. They feel pleased to be around the children and actively participate in play activities. Besides this, they exhibit aggressive behavior towards the enemy and may bite them for the guarding and protection purpose. Environmental factors are involved in the determination of the behavioral traits. Just like every species, this dog breed also possesses the genetic traits which are responsible for the determination of the dog’s behavior in different circumstances. The environmental conditions are involved in the modulation of responses. IT may involve the training methods, punishment, environmental stimulation levels, experience, socialization and certain physical factors. Never consider sending your pet to a pen or kennel if it exhibits poor response to the training. Many of the Bullmastiff dogs love to be around the other people. When they are not allowed to be near to people then often they show irritating behavior. Depriving the dog of interacting the people by isolating them can prove fatal. Sometimes, it becomes hard to manage them in such circumstances. One of the bravest and honest dog breeds, Bullmastiff, is a wonderful pet. Children feel quite comfortable in the company of this dog. Bullmastiff dog temperament is ideal. Bullmastiff dog is devoted, reliable, calm, docile, courageous, protective, reserved, alert and loving. These are the breed for the purpose of guarding and protecting their owners. It won’t be wrong to describe its temperament as “confident and fearless”. It is one of the best-suited pets. Bullmastiff leaves no stone to win its owner’s heart through its positive and willing to please nature. The Bullmastiff dog who are brought up with the kids is the most desirable and favorite one. They please the kids by actively playing with them. You would be amazed to know that even a little Bullmastiff dog show its concern in guarding and protection. The owners can feel relaxed when their kids are with this pet. Fighting with the enemy is in the blood of this breed. When you select a Bullmastiff dog then you not purchase a pet but also get a shield of protection. Bullmastiff dog separation anxiety gives rise to the destructive behavior. This behavior usually occurs when they do not find their owner at the home. It is one of the most common reasons for their separation anxiety. They also exhibit their separation anxiety in several other ways such as by barking or howling. They show agitation and keep on barking to represent their boredom and anxiety. In addition to this, some of the dogs depict it by soiling indoors. If you are looking for the ways of dealing with such behavior then a highly professional and expert canine behavior practitioner can be amazingly helpful in this regard. Do not let your pet suffer from anxiety and treat it as early as possible. There are several ways of treating it. The best method to be adopted is dependent upon various factors such as dog’s response, anxiety level, and symptoms. Therapy of separation anxiety may include behavioral or environmental modifications. In addition to this, relaxation programme techniques could work wonderfully. For some dogs, the temporary medication therapy could prove to be effective. Do you want to purchase a dog that perfectly guards you and your family against the intruders but is afraid of their barking? If yes, then you are in the right spot. Here, I will let you know about the dog which provides brilliant protection and does not bark a lot. Bullmastiff dog is the perfect pet you are looking for. Treat your pet just like your family member and you would experience outstanding love and affection in return. Everyone wants their pet to take active participation in training and socialization. Bullmastiff shows a highly positive response to socialization and training. Here it is necessary to mention that the Bullmastiff is such a dog which should be socialized as early as possible. Bullmastiff dog barking neither irritates the owner nor the neighbors. Hence, one does not need to feel scared about taking their pet outdoor. Although Bullmastiff dog is of quite pleasant nature yet they bite while fighting or guarding. You would be amazed to know that the Bullmastiff dog biting is quite harmful. One needs to seek medical attention rapidly if one’s get bitten by the Bullmastiff dog. One may suffer from the long-term medical complication through its bite. It not merely uses its teeth for the biting but also uses the whole of its power to attack and bite the enemy. The trained Bullmastiff dog is less likely to bite. The owners are held responsible for the compensation when the Bullmastiff bite any individual. It is better to never mess with the Bullmastiff. There exists one common thing In all the above-mentioned methods which are the tapping of the dog’s ear for a minimum of 3 days. This simple method should only be applied after getting suggestion and approval from the veterinarian. Besides the ear tapping method, one can simply use the messaging method to correct the fault of the cartilage. Shedding is one of the most important issues which is related to the pets. Some pets shed more while others shed less. People love to buy the pets which create less mess. The more the shedding would be, the more the mess would be created. Bullmastiff dog shedding is an important factor to be discussed. In this guide, I would let you know about it. The hair of Bullmastiff dog is stiff and short. Like all other pets, it also shed hair which can be found in your clothing, coach, and floor. Bullmastiff dog having single-layered coat is seen to moderately shed their hair. Bathe your brave and loyal Bullmastiff dog when required. Use good quality shampoo for the bathing purpose. Owners should regularly brush the coat of their pet. Use a rubber brush, firm bristle brush or a metal comb for the brushing purpose. It will not only clean the coat but impart shiness to it. Besides this, the loose and fragile hair gets removed by brushing. Maintain proper hygiene and cut down the shedding of hair through regular brushing. Teething and chewing issues are quite painful and decrease quality of life of your pet. Hence, observe your pet carefully in order to figure out that either they are suffering from any teething and chewing issue or not. If you find any then look for the best treatment of it. Bullmastiff dog teething and chewing issues must be addressed quickly. Teething generally does not hurt your pet. It may cause sore or irritation on the gums. If you want to know that either teething disturbs the mood of your pet or not then you would be glad to know, it does affect pet’s mood. It does not have any interference with the mood and activities of the Bullmastiff. Playing, sleeping and other activities are remain in accordance with the willingness of the dog. In case of sores or irritation, teething gels can prove to be effective. Apply it on your pet’s gum to lessen the pain. Dealing with the aggressiveness of pet is one of the toughest scenarios which one might have to experience. Some pets are aggressive by nature while others show aggressive behavior in response to undesirable situations. Are you looking for the ways to calm down a hyper Bullmastiff dog? The overly excited or hyper Bullmastiff dog can be calm down with some simple techniques. Let the dog calm by itself rather than interrupting it. Simply try to ignore its behavior. It allows him to settle down rapidly while interrupting it in such a scenario can even worsen the condition. They may exhibit the outburst behavior when interrupted. Psychological needs are often responsible for the hyperactive behavior of your pet. Try to give a job to your Bullmastiff if it depicts such behavior. Another way of dealing with it is the use of aromatherapy. Besides this, you can calm your dog by taking it to the walk. It kicks away their boredom too. It is necessary to understand the common health issues that many of the Bullmastiff dogs are expected to experience in their life. Not all Bullmastiff dogs suffer from such medical conditions. Majority of them are expected to suffer from it. Hence, the owners should have a clear idea about the possible Bullmastiff dog diseases. This Bullmastiff dog breed all information is designed in order to guide the owners of Bullmastiff dog about such diseases. Now, the owners can easily identify the health problems that might arise and take their pet to the vet for the treatment. Ensure to get the health clearance of the pet which you want to purchase. Allergy is a medical condition which is characterized by the redness and itch on the skin. It is basically a response to the antigens. It can be caused by a number of things such as fleas, food, pollens, grass etc. The new owners of Bullmastiff dog can easily identify the allergy when they see symptoms such as flushing skin, an itch on the groin or feet, excessive hair loss, watery eyes, reddened ears and runny nose. Bullmastiff dog is seen to scratch their skin excessively when they have an allergy. Immediately take your pet to the vet when your pet experience such symptoms. Large breed dogs are more prone to suffer from the elbow dysplasia. Surgery is recommended or medication is provided to the Bullmastiff dog in order to correct elbow dysplasia. This hereditary disease is mainly caused due to the variable growth rates of elbow bone. Such growth pattern leads to joint laxity which ultimately results in the painful lameness. SAS (Sub-aortic stenosis), valvular disorders and cardiomyopathy are the most common cardiac health issues that arise in Bullmastiff dog. On seeing any abnormality and symptoms of diseases, the owners should rapidly contact the veterinarian in order to improve the quality of their pet’s life. It may lead to the heart murmur and can prove to be life-threatening if left untreated. Take the health of your pet quite seriously. SAS is basically the narrowing of the passage of outflow track in the heart. It is a hereditary disease which can be treated by the use of medication. An echocardiogram is used for the diagnosis of SAS. This heart disease is basically characterized by the sick heart muscle. As a result of it, the heart efficiency decreases. It must be treated as early as possible. It may occur as an outcome of viral infection. An abnormal heart valve is responsible for the production of abnormal heart sounds. These may be acquired or congenital and may be caused as an outcome of viral assault. Bullmastiff dog may suffer from the deficiency of thyroid hormone. This medical condition is known as “hypothyroidism’’. Pets suffering from hypothyroidism can be identified by the signs such as obesity, infertility, lack of energy and mental dullness. The dog may also experience the dark and tough skin. In addition to this, the fur of the dog becomes brittle and coarse. It may even begin to fall out. The thyroid replacement pill can prove to be an effective treatment for hypothyroidism. This pill is usually recommended to be taken daily in order to treat thyroid deficiency. This antithyroid pill needs to be taken for the whole life. Cystinuria is a medical condition in which the body becomes unable to reabsorb an amino acid, named cystine. This genetic disorder is characterized by the formation of bladder or kidney stone. Ultimately, it results in blockage of the urinary tract that can prove to be fatal. This condition occurs more commonly in males. Urine nitroprusside test is often used for the diagnosis of this disease. It is an inexpensive test. Avoid breeding the dogs suffering from this inherited disease. Skin disorders are common to the Bullmastiff dog because of their sensitive skin. Hence, they are much prone to skin irritations, sores, and rashes. Keep your pet away from inhalant or contact allergies such as chemicals, detergents and airborne allergens such as mildew, pollen, and dust. Hence, the owners of Bullmastiff dog should check the skin of their pet regularly. Changing the diet may help to some extent. It is better to replace the diet with the one having no or few chemical additives in it. Immediately take your pet to the vet on observing the signs of skin disorder. Keep on checking your pet’s skin regularly in order to treat it quickly, when required. Sometimes, a long-term treatment is required. In such treatment, steroids or antibiotics are given to the Bullmastiff dog. People who do not consider to tape the ear of their Bullmastiff dog and take it for granted are responsible for the incorrect shape of their ear. Prevent the spoiling of the dog’s ear by taking the sagacious step of taping. The shape of Bullmastiff dog’s head becomes incorrect by ignoring taping of the ear. Well, if you are looking for the ways of taping then there exists a number of ways that can help you out in maintaining the right ear’s shape of Bullmastiff dog. Choose the method as per your desire and convenience of your pet. Selecting the right method is efficient and helpful in preventing the ear infection in bullmastiff dog. The chances of ear’s infection get increased when an unsuitable method is being adopted. Bullmastiff dog is a breed that results due to the crossing of Bulldog and Mastiff. This breed originated in England. These reliable and powerful watchdogs are developed from 40% Bulldog and 60% Mastiff. These are regarded as “Gamekeeper’s Night Dog’’ because of their ability to catch and run down the poacher. They are brave enough to hold the intruder for long. This giant breed is an amazing breed which is giant in appearance. These are generally known to suffer from a number of health issues such as cancer, bloat, hip dysplasia etc. Many of the pets kick out their bucket due to cancer in the golden years of their life. This leading cause of death usually occurs at the younger age. This notorious disease is tough to be diagnosed at the earlier stage of life. Hence, it is better to take your pet to the vet for the medical checkups on a periodic basis. A good fact to know is that many of the cancers are treatable. These can be treated if it gets diagnosed at an early stage. Surgery is one of the most effective ways of treating cancer. Surgical removal of the affected part or tumor would prevent the spread of it to the whole body. Chemotherapy is another consideration for treating cancer. It includes the administration of medication against cancer. Examining the pet for the bumps and lumps is beneficial as it helps in the early detection of tumor and cancer. Likewise, the periodic testing of the blood may detect the changes in the body. Gene mutation is the main cause of cancer in Bullmastiff dog. Many of the mutations in the gene are not inherited and occur after the birth of your pet. A number of factors are involved in causing gene mutation. These include obesity, hormonal changes, lack of exercise, cancer-causing chemicals, radiations and chronic inflammation. Preventing from such risk factors can prove to be useful. Bullmastiff dog is prone to suffer from Hemangiosarcoma. This type of the cancer is characterized by the bleeding tumor. The size of this bleeding tumor can be a volleyball size or even larger. It mainly develops in the spleen. However, it may also occur in other organs of the body. This tumor may burst and results in internal bleeding. A yearly blood test can save the life of your pet as it let you know about the status of tumors and cancer at their beginning. 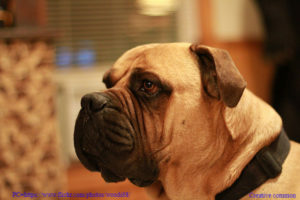 Bullmastiff dogs are at greater risk to develop Lymphoma. Lymphosarcoma or lymphoma is such kind of cancer which is characterized by the formation of abnormal lymphocytes. Lymphocytes are one of the types of white blood cells. White blood cells or leucocytes are present through the body of the Bullmastiff dog. This is the reason that lymphoma in Bullmastiff dog may appear at any part of the body or can spread anywhere. A good news to know is that this is a treatable kind of cancer. A great response is seen in the dogs by the use of chemotherapy. It is most likely to detected at the early stages. A complete blood count of the pet is recommended as it helps in the diagnosis of many diseases. Lymphoma is one of such diseases that is detected by CBC. Other symptoms of lymphosarcoma to be considered are weight loss and swollen lymph nodes. Bullmastiff dog mast cell tumors and surgery are comprised of the full-fledged awareness about the tumor and its effective treatment. Mast cells are an important part of body’s response to allergens and inflammation. They play their key role when any allergen enters into the body or there exits any inflammation in the body. These blood cells get activated ins such circumstances. Unfortunately, sometimes they may develop a tumor in them that ultimately becomes cancerous. They may even spread to the various organs of the body. Most common sites exhibit the mast cell tumor are skin, bone marrow, liver, spleen and lymph nodes. They may even metastasize. Grading is helpful in making a prediction about the metastasis of mast cell tumor. For the initial evaluation of tumor, blood test and biopsy are helpful. Early detection of mast cell tumor can save the life of many dogs. The best way of getting rid of a benign mast cell tumor is the surgical removal of it. A localized tumor can be treated quite easily rather than the systemic one. Besides surgery, chemotherapy, and radiation are also considered for the treatment purpose. The method of treatment is entirely dependent on the nature, type, and stage of cancer. Both humans and dogs may suffer from allergies. A number of factors are responsible for causing allergy. Human beings are supposed to sneeze or may have itchy eyes in response to the allergy. But, in the dogs, the symptom of an allergy is mainly exhibited by the itchy skin rather than sneezing. Atopy is the terminology used for such kind of skin allergy. In atopy, Bullmastiff suffers from the frequent eye infections, licking of paws and the rubbing of the face. These signs are the clear indication of atopy in Bullmastiff. The owners of the dog would be pleased to know that there exists plenty of treatment methods for the Bullmastiff dog allergies. It is necessary to keep the dog away from the factors that contribute to the allergy. Avoiding the exposure to the allergens would prevent the allergy. The improper functioning of stomach invites plenty of disorders such as acne, indigestion, bloating, ulcers etc. 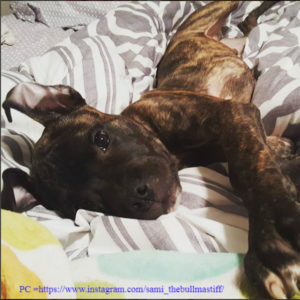 Bullmastiff dog stomach issue should be addressed immediately. This breed usually experiences with a number of stomach issues. Ensuring the proper diet at the right time can improve the digestion. Besides this, the healthy physical activities are necessary to avoid the unpleasant condition of the stomach. Consult a veterinarian on observing the symptom of stomach disorder such as flatulence, acidity, stomach ache, loss of appetite, bloating etc. It can be corrected with the help of medication and physical activity. Bloating is a medical condition which occurs in the pets having deep and narrow chests. Bullmastiff dog is the breed which is more prone to suffer from bloating issue. In the Bullmastiff dog bloating issue, gas gets accumulated in the stomach of the pet. This accumulation of gas is due to the twisting of the stomach which in turn cuts off the supply of blood towards the stomach. It is recommended to take your pet to the vet in order to treat its bloating issue. Bullmastiff dog eye disease is a matter of concern as it causes a decrease in the quality of your pet’s life. The proper functionality of the eye is indeed a great blessing which cannot be denied. Any fault in the functionality of the eyes can badly hinder the Bullmastiff dog to perform his activities in an efficient way. It is unfortunate that many of the Bullmastiff is at greater risk to develop several eye diseases. One of the leading cause of their eye disorders is inheritance. Owners should consider this illness to be serious and should their pet to the vet in order to ensure the good quality of their pet’s life. Eye diseases may even lead to the blindness, in case, if left untreated. Eye disorders are quite painful and hinder the dog to enjoy its life to the optimum. Just like the CBC, it is necessary to evaluate the functionality of the eyes on a periodic basis. On observing, any sign of poor vision, pain in eye or abnormality in the eye, immediately take your Bullmastiff dog to the vet. Many of the problems can be treated by the medication. Avoid any delays. Else, you may risk the health of your pet. Entropion is one of the most common eye diseases which affect the Bullmastiff. It is characterized by the inward rolling of the eyelids. It causes the rubbing of eyelashes against the surface of the cornea. The pet suffering from Entropion experiences extreme pain and irritation in its eye. Ultimately, it can lead to the most drastic situation which is blindness. Not only Bullmastiff dog suffers from entropion, but the dogs from the other breeds are also seen to suffer from this notorious condition. Well, the Bullmastiff mainly exhibits the diseases which are inherited to it. Just like many other diseases mentioned above, entropion is also an inherited disease which gets transferred from the parents to the next generation. This heritable disorder can be corrected by the help of surgery. Cataract is such a medical condition in which lens of the eye becomes much opaque. It diminishes the visibility and the dog becomes unable to view the objects clearly. Bullmastiff dog suffering from cataract experiences everything as cloudy in appearance. This can also lead to blindness when left untreated. The best way of combating with such a situation is the surgical removal of a cataract. It ensures the restoration of the eyesight. Both humans and dogs get affected by Glaucoma. It is an eye disease which is quite painful and quickly leads to blindness. Immediately take your pet to the veterinarian when you observe any of the symptoms of glaucoma. These symptoms include redness, blurring of the cornea, squinting and watery eyes. In many of the advanced cases, the building of the eyes is seen. The eye becomes swollen and enlarged in appearance. A continuous stabbing feeling is there. Its early treatment is possible when it gets diagnosed at the early stage. Hence, the glaucoma screening on the yearly basis is recommended in this regard. Ear infection is one of the most painful conditions that affect the quality of your pet’s life. A Bullmastiff dog suffering from the ear infection becomes unable to actively participate in its routine activities. The infections which are left untreated proves to fatal and may lead to drastic conditions. An ear infection may be due to the invasion of the virus or bacteria. The most common microorganisms that are prone to cause ear infection in Bullmastiff are distemper, parvo, and rabies. Having a good knowledge about the health concerns of your pet, you can prevent it from various diseases. Many of the ear infections can be prevented by vaccinating the dog. Seeing your dog in the pain is one of the worst feelings which surely no one wants to experience. Owners of the dog treat their pet as their family member. It is excruciating when you see your pet suffering from poor health conditions. One of such painful health condition is Arthritis. Bullmastiff dog arthritis may occur at any stage of life and badly strike your pet into ache and helplessness. Owners usually consider the prescription NSAIDs for the treatment of arthritis. NSAIDS play their role in relieving the pain of arthritis but may affect the liver. Likewise, steroids are also responsible for causing a number of side effects. Combating with arthritis is necessary in order to ensure a better quality of life. Hence, there exist few useful steps that can treat arthritis and make the dog feel comfortable and pleased. Pain-free life is the greatest blessing. Not let the pain stay in your pet’s life. Weight and pain are in direct relation to each other. The more healthy a dog would be, the more strain it would experience on its joints. It is better to adopt the weight loss regimen for the dogs having excess weight. Lucky are those who fall in the range of healthy weight. Owners should try their best to maintain this weight of their pets through gentle exercise and balanced diet. The addition of anti-inflammatory food is beneficial for the joint pain. Ginger, alfalfa, papaya etc are the foods that naturally contain anti-inflammatory properties. Likewise, one of the strongest anti-inflammatory items that are effective to be used is turmeric. IT is being used for thousands of years and greatly helps in diminishing the pain. Bullmastiff dog exhibiting the complaints of joint pain can be managed well by using such anti-inflammatory food. The low-level laser therapy is a new and great innovation in diminishing the pain and inflammation in the pets. This is a rapid, simple and painless procedure. The schedule of this therapy is decided by the veterinarian as per individual’s need. The aching joints and stiff muscles get amazing relief from the massage therapy. This method not only reducing the pain but also refreshed the pet to perform his activities in the most brilliant manner. Supplements are also being used for reducing the joint pains. These are easily available in the market. Choose the joint health supplement that contains the great quality ingredients in it. Movement of the body parts ensures the reduction of joint pains in the dogs that are diagnosed with arthritis. Keep moving particularly means to stay active. By considering the movement of the body, the proper functions of the body are ensured. It involves regular walks and routine exercise. Avoid strenuous exercises and arrange short play sessions for the pet. Besides the above-mentioned methods, there are many other ways, treatment options, supportive methods and preventions that can be helpful in arthritis. Owners that are worried about the health condition of their Bullmastiff dog should consider replacing the unsupportive mattress with the supportive orthopedic dog bed. It is specially designed to provide a soothing and calming effect on the dog. The use of unsupportive mattress should be avoided as it may cause sore joints. Use of friction socks and keeping the toenails trimmed can avoid the slipping of your pet. Hydrotherapy is a type of physical therapy which many of the vets adopt to lessen the joint pain. Bullmastiff is one of the dog breeds which are at higher risk to develop epilepsy. A seizure is a popular indication of epilepsy. The seizure is notorious to weaken the dogs and even trouble the owners too. These can be cluster seizure or generalized seizures. Generalized seizures can be characterized by the low of consciousness, contraction of skeletal muscles, jerks, rigid body and urinary incontinence. Many of them even vomit in seizures. The head injury seems to be a mild injury but it has the potential to worsen the condition. If your dog gets a serious hit on its head then do not take it for granted. Take it to the vet for the proper examination. Seizures in Bullmastiff dog can be treated by giving it the right anti-epileptic drug. Owners love to spend quality time with their pets. They love to hug and kiss them but what it your dog have bad breath? Surely, it is a weird situation when you do not want to kiss your Bullmastiff dog because of its bad odor. The smell of the breath is the prime fragrance which an owner encounters after getting his beloved dog at home. Bullmastiff dog bad breath is a clear indication of the health issues that it faces. Most common health issue leading to bad odor are stomach disorders. Bad breath is responsible for spoiling the special moments and strong bond between the owner and dog. Puppies experience the change in their breath when they are facing issues of milk teeth. Bleeding is another cause imparting to bad odor. Random eating habits or not washing the teeth is another cause of flourishing of bacteria in the mouth. These bacteria grow well and even forms plaque on the teeth. Ultimately, the breath of the dog becomes bad. Vitamin supplements and good quality food should be used to avoid such unpleasant scenarios. Likewise, maintaining proper hygiene ensures good breath and better health. Improperly digested meal leads to stomach disorders. Accumulation of gas in the body does not merely cause a problem but also become a cause of pain. Surely, no one likes to have farting dogs. Gas is such a health issue which makes them to fart. Gassy dogs spoil the environment of the room and owners hesitate the to introduce with their guests. Bullmastiff dog gas should be treated by using the carminative. Ensuring proper exercise prevent the problem of gas. Avoid feeding the dog with the foods that cause gas in the stomach. GIT problems and some infectious diseases lead to flatulence. The bowel movements also get disturbed and there exists the high risk of constipation too. This is a highly undesirable scenario. It does not merely irritate the dog but the owner gets affected too. Hence, it is better to take the Bullmastiff dog to the vet when it first shows the sign of flatulence. Else, the condition may be prolonged and take much of the time to recover. Bullmastiff puppy and dog whining issues should be known to the people who are looking for the details about the Bullmastiff dog in order to buy it. They bark so loudly that the kids in the surrounding may even get afraid. Training them properly can help to prevent such issues. Their whining and barking are strong, powerful and loud that may sometimes annoy the owner. They even whine to get attention from their masters. Various cases of hypothyroidism in Bullmastiff dog are reported on a yearly basis. The thyroid problem in the Bullmastiff dog is due to the deficiency of thyroid in the body. The impairment of thyroid gland and improper functionality of thyroid is responsible for causing this disease. The deficiency of thyroid can be fulfilled by giving thyroid tablets to the dog. Bullmastiff dog acne is such a disorder which usually occurs during puberty. IT is characterized by the formation of plenty of pimples on the skin. It is not a huge problem for the dogs as acne gets removed when the dogs reach to the adulthood. Having acne at the puberty is quite common. Dogs are not as conscious as humans about their acne. Anyhow, this unpleasant disorder should be addressed in order to prevent its spreading to different parts of the body. Following the simple hygiene is quite necessary. Likewise, ensure the removal of oil from the dog’s skin. Oil aggravates the condition and makes acne worse. Oil is responsible for clogging the pores. Clean the skin and ensure bathing for your dog. Hormonal disturbance leads to acne. Dogs can get rid of acne by taking medication. In addition to this, anti-acne shampoo should be used. Snoring disturbs ones sleep especially if the snore is loud. Bullmastiff owners should have basic knowledge about their pet’s habit and characteristics. Bullmastiff dog snoring is quite common. It snores quite loudly. Extremely loud snores are enough to awaken the owner at night. Hence, the Bullmastiff dogs should be sent to their dog house for sleep. Keeping this doghouse away from the owner’s bedroom aids the owner to sleep well at night, without being disturbed. They keep on snoring consistently throughout their sleep. Demodectic mange in Bullmastiff dog is generally seen when they are young. Demodex Canis is the causative agent of Demodectic mange. This disease is also known as puppy mange, red mange or follicular mange. You would be surprised to know that these mites are generally found on the body of both dog and humans without causing any effect on them. Inadequately developed or suppressed immune systems give rise to Demodectic mange. In this disease, isolated lesions start forming on different parts of the body. The signs of this drastic disease include red crusty skin, hair loss, and moist appearance. Hair loss occurs around eyes, head, and muzzle. Bullmastiff dog stomach and intestinal blockage occur due to their utmost desire to eat almost everything. Surely, many of the owners have not heard about this gastrointestinal blockage issue. But, it is a fact that the dogs are at greater risk of blocking their bowel due to the rapid eating of random food. With medical attention and brilliant care, this medical condition can be effectively treated. Intestinal and stomach obstruction can be indicated conveniently when the symptoms are known to the owner. Its symptoms involve weakness, dehydration, vomiting, bloating and loss of appetite. Bullmastiff dog water and drinking issues are being reported by a few owners. According to them, their dog drinks a lot of water and urinate frequently. Well, it is not an issue and there does not lie any medical complication in it. Even, the owners should try to provide frequent water to their dogs especially in summers in order to prevent dehydration. When the Bullmastiff dog drinks less water then it invites stomach disturbance, poor digestion, and bad breath. Bullmastiff dog dry noses are being developed by a majority of dogs. You would have seen many Bullmastiff dogs around you who have a crusty, dry and raw nose. Among the various factors, the most popular one is the canine issue. One of the main culprits causing dry and raw noise in Bullmastiff dog is nasal hyperkeratosis. Large breed dogs are mainly affected by a congenital disorder, known as “Hip Dysplasia”. It is a quite painful situation which imparts lameness and weakness. Ultimately, the dogs suffering from hip dysplasia suffers from arthritis. Bullmastiff dog colitis is the inflammation of the colon. Colon is a part of the large intestine. Inflammation or swelling in the colon indicates the poor performance of the bowel. The gastrointestinal issues such as colitis take longer to recover. Many of the GIT disorders relapse. This uncomfortable and unpleasant situation causing diarrhea. Bullmastiff dog cardiomyopathy is one of the most spreading diseases of this breed. Arrhythmia, occult DCM, congestive heart failure and sudden death are the clinical manifestation of cardiomyopathy. In cardiomyopathy, the heart becomes inefficient to pump its blood to the whole body. The overloaded heart leads to cardiac failure and can be fatal enough to cause the death of a dog. Hence, the owners should try to keep their dogs safe from strenuous exercises and should consult a vet on observing lethargy, shortness of breath, anorexia, transient loss of consciousness, coughing, excessive breathing and abdominal distention. Bullmastiff dog ear mites are a clear sign of poor hygiene. Getting rid of it is quite tough. Hence, the owners should try to maintain the hygiene of their dogs and consult the veterinarian. It causes discomfort to the dogs and may even lead to infections. Shaking and scratching of the head is the general symptoms which aware the owner about these ear mites. Ear mites are the ectoparasites which reside in the ear canal. Skin problems in Bullmastiff dog can be due to a number of reasons. It may be due to allergy, bacterial infection or fungal infection. Common skin diseases of Bullmastiff are atopic dermatitis, scabies, psoriasis, eczema, and allergy. Eczema is such a non-parasitic infection which is characterized by the itching and dryness of skin. The condition of skin becomes worse when it causes open sores or bumpy scales on the skin. A dermatologist can better help to recover from such notorious disorders. Diet is a key factor which can ensure better and healthy skin. Avoid taking food that contains an allergen. Cleanse the skin in order to keep the dog safe from acne and pimples. Bullmastiff dog care involves a huge number of aspects which should be covered quite effectively. New owners feel difficulty in understanding the needs of their pet. Hence, sometimes they become unable to fulfill the demands of their pets as per pet’s desire. Care and love are the two important factors which strengthen the bond between the master and pet. Dogs are popular for their unconditional love. These characteristics make them one of the most brilliant choices of people throughout the world. Caring the dog includes enormous parameters. Provide them the most relaxable and soothing doghouse where the Bullmastiff dog feels pleasure. Owners are responsible for maintaining the proper hygiene of their pets. An unhygienic dog is prone to more health issues. Bullmastiff dog teeth and dental care is ensured by the help of regular brushing. Brushing ensures the prevention of the teeth and gums from the germs. No one likes the bad odor from the mouth of their pet. Brushing not only prevents the issues of bad odor but also aids in providing the bright and shiny teeth to the Bullmastiff dog. Dental chews can be used for the good dental health of the dogs. Bullmastiff dogs are among the breeds which are prone to experience more dental problems than the others. Hence, owners need to be more cautious about this and try to prevent oral diseases as much as they can. Veterinarian strongly recommends the dental cleaning. Tooth decay and gum issues should be prevented by using the right toothbrush and effective toothpaste. It is ideal to brush the teeth of Bullmastiff dog on each day but sometimes it becomes problematic. Hence, brushing twice or thrice a week can also prove t exhibit good outcomes. Feed the dog on the healthy diet and consult the veterinarian on observing signs of tooth decay or poor teeth health. Taking brushing for granted leads to the formation of plaque on their teeth. The giant appeal and marvelous looks of the dog diminish when they have had a plaque on their teeth. Bullmastiff dog having sparkling teeth are the most desirable one. Quality dental chews are helpful in removing plaque from the teeth. It is basically due to the action of ingredients present in the dental chews. Consider using these chews when you find a plaque on your beloved dog’s teeth. Bullmastiff dog exercise should be conducted on daily basis. It not only helps in maintaining the right body weight but also makes them energetic and active. Strenuous and excessive exercise should be avoided as it may lead to joint aches and body pains. Not only Bullmastiff dogs but the puppies should also be taken to the morning walk and exercise. The functionality of the body parts becomes better. Excercise is also a rudimentary need of the Bullmastiff dog just like the balanced diet. Bullmastiff dog eye boogers are quite a common issue that many of the dogs experience. Eye discharge or boogers are the outcomes of allergies or a few eye disorders. Dust and dirt may also contribute to the eye discharge. Allergic eye drainage or eye boogers due to dust and dirt are normal. Consult the veterinarian when your dog experience excessive eye booger as it may even cause serious eye diseases. Eye drops or medication can prove to be effective for the treatment of eye boogers. Eye ointments and drops provide a soothing effect in such medical condition. New owners who just bought the Bullmastiff dog require guidance about the care of their dog. They need to know how to treat their dog in harsh and unsuitable weathers. The routine activities such as walking, exercise, and playing should be performed at the cool places. Keep your dog protected from the sharp sun rays. The best suited time for the activities of the dog is early morning and sunset. Winter invites the frosty days in which the temperature reduces. Just like humans, dogs also need to be protected and safe n such a chill weather. Owners need to play their key role in keeping their dog warm and safe in the winters. Bullmastiff dog winter care involves various ways. The owner keeps their dogs inside the house. The dogs should wear sweaters while going outside for the exercise or walk. Besides this, the diet should be in accordance with the weather. Take your pet to the vet if it catches a cold. The dog house needs to raise up almost a few inches from the ground level. Cover it properly by using the heavy plastic or waterproof sheets. The doghouse should not be in direction of the wind. The premium quality dry food is the best dog food for Bullmastiff dog. Divide the food into two portions which are meant to be taken on daily basis, throughout their whole life. Keep the treats minimum in order to prevent the Bullmastiff dog to feel much heavy. For the traditional carnivores, raw meat is the best food to be provided to the dog. It can of chicken, beef or lamb. It balances the level of calcium for the dog. Not merely meat is enough. The diet should be a combination of a variety of food. Dogs should be watched properly while eating, especially when you provide them bones in the food. They may choke their throat and may even lead to death. Raw fruits and vegetables are also a part of balanced diet. Crush, grate or chop fruits, vegetables, and egg and let the dog feed on it. Avoid giving raisins, chocolate and corn cobs to the dogs. The more rapidly a giant dog grows, the more danger it causes to itself. It is necessary to feed the Bullmastiff dog properly in its growing age. Bullmastiff dog calorie requirements need to be fulfilled as it prevents the dog from various diseases too and maintains the recommended body weight as well. Taking food having high calorie in it can lead to obesity and health issues such as cardiovascular disorders. Fruits that a Bullmastiff dog can eat should be high in quality and rich in nutritional value. Proper and balanced diet ensures the maximum output from a dog. Make your dogs be the super active dogs by providing them the healthy diet. Feeding the pet with the right proportion of food at the right time works wonder. Feed the dog when it is hungry. Appetite indicates the great functionality of stomach and digestive system of your pet. A Bullmastiff puppy can eat the soft food while the mature Bullmastiff dog can take a great variety of food and can even chew the bones. Bullmastiff dog diet plan is designed in accordance with their age group. The diet plan for a 3-6 months dog includes the 3 times feeding. Eggs, milk, soft food, bread, boiled vegetables etc should be used at the early stage of their life. For a dog of 1-12 months, the frequency of feeding gets shifted from three times to two times daily. Bullmastiff leads to the maturity after the age of 6 months. At such age, it is highly recommended to add the protein-rich food to the dog’s diet. It includes the addition of food items such as meat, boiled green vegetable, lean meat, liver, red meat bones, eggs, and bananas. Also, consider modifying the diet by removing all sorts of the grain feed. It is the age that allows the owner to add the chewing bones in the diet. Likewise, one may also add on snacks in the diet. This type of food ensures the proper development of the dog’s jaw.